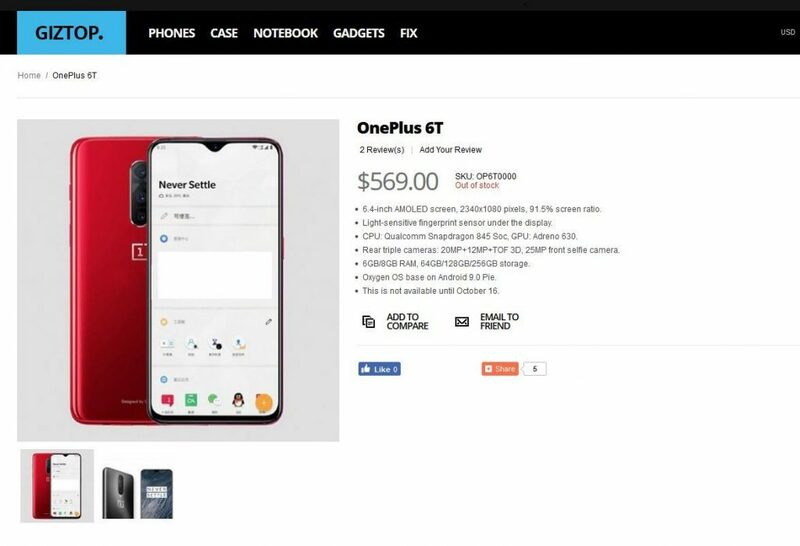 OnePlus 6T Pricing, Specs and Images Leaked Through Retailer Listing - Playfuldroid! Rumors have it that the OnePlus 6T may go official on Oct. 17. The handset is expected to arrive as the first phone with in-screen fingerprint reader. Today, the smartphone has been spotted on Giztop, an online retailer from China. The listing has revealed the specifications, images and pricing of the phone. The OnePlus 6T listing on Giztop shows that it features a 6.3-inch AMOLED screen with a waterdrop notch. It supports Full HD+ resolution of 2340 x 1080 pixels and 19:9 aspect ratio. The Snapdragon 845 chipset is present as the driving force of the phone. It has a front camera of 25-megapixel. The specs sheet also show that it features a triple camera setup which includes a 12-megapixel sensor, a 13-megapixel sensor and a third ToF 3D sensor. The 64 GB model of OP6T has 6 GB of RAM whereas 8 GB of RAM is available on the 128 GB storage variant. The handset is loaded with OxygenOS which is based on the latest Android 9 Pie. The listing reveals that the base model of the phone has a price tag of $569. The Giztop listing of the OP6T seems to be based on the rumors surrounding it. Hence, it does not show anything new.